On first glance, a site that collects people’s opinions about whose life an autonomous car should favor doesn’t tell us anything we didn’t already know. But look closer, and you’ll catch a glimpse of humanity’s dark side. The MIT team launched the Moral Machine in 2016, and more than two million people from 233 countries participated in the survey — quite a significant sample size. On Wednesday, the researchers published the results of the experiment in the journal Nature, and they really aren’t all that surprising: Respondents value the life of a baby over all others, with a female child, male child, and pregnant woman following closely behind. Yawn. 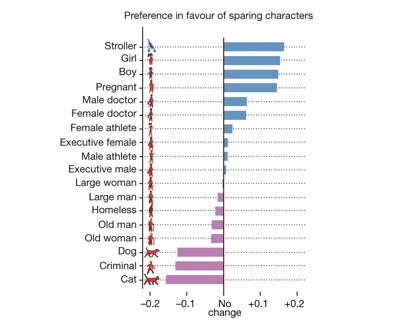 It’s when you look at the other end of the spectrum — the characters survey respondents were least likely to “save” — that you’ll see something startling: Survey respondents would rather the autonomous car kill a human criminal than a dog. While the team designed the survey to help shape the future of autonomous vehicles, it’s hard not to focus on this troubling valuing of a dog’s life over that of any human, criminal or not. Does this tell us something important about how society views the criminal class? Reveal that we’re all monsters when hidden behind the internet’s cloak of anonymity? Confirm that we really like dogs? The MIT team doesn’t address any of these questions in their paper, and really, we wouldn’t expect them to — it’s their job to report the survey results, not extrapolate some deeper meaning from them. But whether the Moral Machine informs the future of autonomous vehicles or not, it’s certainly held up a mirror to humanity’s values, and we do not like the reflection we see.